For the patient room environment, the LG LQ630H Series Healthcare LED TV features advanced technologies with sleek design, including invisible speakers and unique pillow speaker ports. This combination of style and technology provides a pleasant diversion during the hospital stay and makes the room more comfortable for patients and families. Integrated Power Saving modes provide added energy savings for hospitals looking to upgrade technology without an increase in energy output. 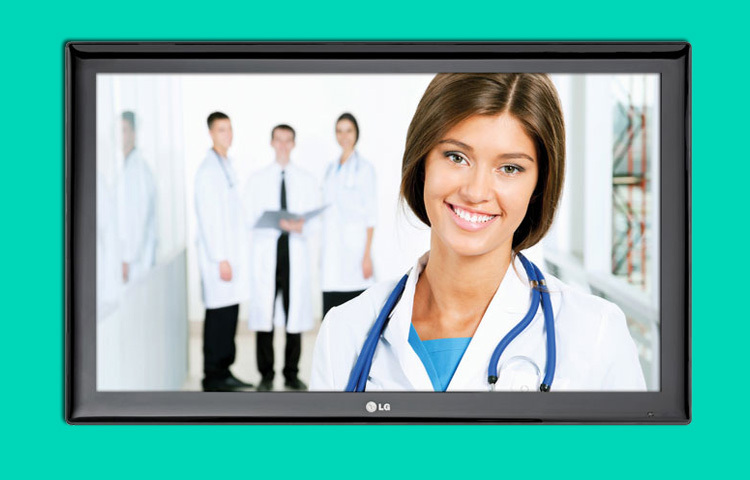 An industry leading Pay-Per-View (PPV) compatible television to include an embedded applications platform, LG’s new LQ630H series allows healthcare facilities to customize the patient room experience. Pro:Centric provides an easy way for the LQ630H series to interface with interactive program guides, games and internet data feeds, as well as applications designed to connect patients to services such as room service menus and patient room information. LG’s hospital-grade patient room televisions feature a Splash Image/Logo (Customized Welcome Screen) feature that allows a healthcare facility to enhance their brand image. It gives the installer the ability to upload a logo/image so that a patient can view it on-screen when they turn on the TV. The logo/image is easily uploaded by using a USB memory device. * May require optional software, hardware, third-party subscription service/contract, and customization at an additional cost. Pro:Centric enabled pillow speaker required.